Meet the Malaysian rock band Volatile, a local six-piece rock band from Penang. With their recent release of their sophomore album, It’s About Art, Raul (the bassist) talks to Sevenpie about the band and their experiences in the local music industry. This is their story of hustle and building on what they’ve already made. Enjoy! 1. Hi Raul, please give us a brief introduction about Volatile. Hello! We’re a 6-piece rock band from Penang, featuring some of the island’s most active musicians. Our music is probably best described as a modern take on the classic progressive rock sound, and we always try and maintain a feel-good vibe when we’re performing on stage to get people up dancing and smiling. 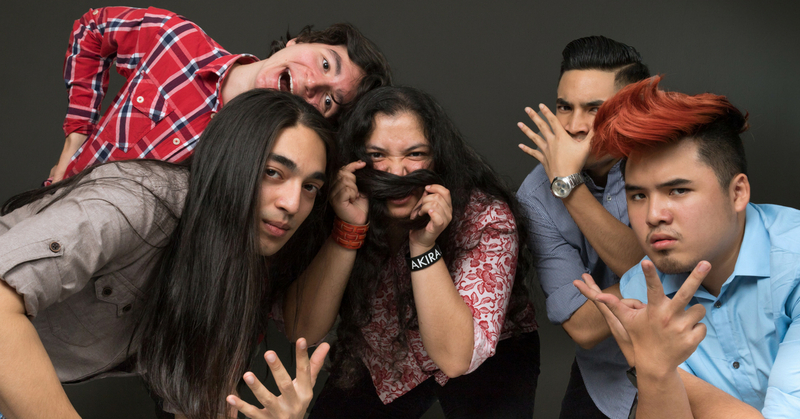 The members of the band are: Sean Choon on lead vocals, Jaime Gunter on lead guitar, Raul Dhillon on bass guitar, Jordan Scully on drums, Reuben Tor on keys and Kishan Nadesh on rhythm guitar. 2. What made you all decide to form a band together? Well, Volatile was originally a school band formed by our guitarist Jaime and her cousin Antoine 7 years ago (our lead singer’s voice was probably about 2 octaves higher back then!). Over time though, especially since releasing our first album Taking Flight three years ago, the band has had a bit of a change in lineup and grown a lot, but we still try to carry on the sort of charm and intimacy of the band from those early days. 3. Is there anything in particular that inspired your new album, It’s About Art? We went into this new album with the aim of making the whole album feel like an experience rather than just a collection of songs – it’s a story running through from beginning to end. There seems to be a really exciting trend of people getting interested in concept albums again, and we adore that kind of thing so much that we just knew it was the direction we wanted to go. 4. What was your experience like, working on your sophomore album? Working on this album has been a very different experience compared to our first album. For our first album, we had about 2 or 3 months to record and figure out what we were doing before Antoine (our first drummer) left for Australia. It was an exhilarating experience, but also very stressful because of the time frame. This time with It’s About Art, we’ve been able to take more time to play around with the arrangements and ideas in the album, which has been fun and interesting. What you’ll be hearing is the product of nearly 3 years of experimentation. 5. Are there any particular themes or ideas you explore in this album? 6. What were some of the challenges you faced in making your second album? The major challenge was that we had to record down in KL, and everyone in the band is based up in Penang. Finding days free in each other’s schedules to go down, alongside the logistics of travelling, could sometimes be a bit of a nightmare. We’ve learned a lot from that though. We’ve gotten quite a good routine when it comes to travel now, so moving around to play shows has never been easier for us. 7. Please tell us about your experience recording your second album in Malaysia. It’s been incredible to have worked with some of the most warm, humble and hardworking people in the scene for this album. We’ve received priceless advice and support along the way, and have made lifelong friends. I think that sort of thing is only possible in something like the Malaysian music scene. Special mention to Ashwin Gobinath from Nadir, who we’re so grateful to have had engineering the album and sharing his ideas to make the album sound how it does, all while making us feel comfortable throughout the recording process. 8. What are some of your favourite tracks off the new album? I love each track for different reasons, but if I was to pick personal favourites, I would say On The Attack, which is this gloriously chaotic ride, and Culture Vulture, which has a more of a beefy and pulsing rock sound. A favourite between the band though is I Don’t Know, which is a gentler, lush ballad which came out sounding even better than we thought it would. 9. What were some of your biggest highlights during the production of your new album? Probably when we got Brendan De Cruz to feature on one of our songs, both because he’s an amazing person and because we asked him to do some ridiculous things for the album. I can’t even describe exactly what it is. It was hilarious, and it just got better and better cause he kept messing up the takes. The outtakes were so funny that we ended up including them in the album too. 10. What advice would you offer to any aspiring musicians in Malaysia? Just always remember that you are a person first and foremost, rather than an artist. That means you have to take care of your own health and your relationships with others, and stay humble and empathic. There is no such thing as too much thyme. Follow Volatile on their Facebook and Instagram to learn more about their music!